Do You Have Your Unique School Registration Code (USRC) ? 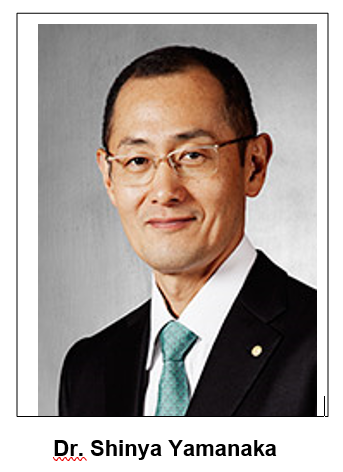 Shinya Yamanaka is a stem cell scientist from Japan, born in 1962. He began his carrier as a surgeon after obtaining his degree in medicine. He returned to Studies for his Ph.D. to solve the mysteries of diseases that had no cure. During his Ph.D., he developed interest in gene engineering technologies. With the aim of developing gene therapy for familial hypercholesterolemia to prevent arthrosclerosis, he worked on mRNA editing factor, APOBEC1 (Apo B mRNA editing catalytic subunit 1), that turned out to be an oncogene. His discovery of NAT1 (Novel APOBEC1 Target #1), a tumor suppressor and further work on this molecules, exposed him to mouse ES cells. He found that NAT1 is essential for maintaining the pluripotency of ES cells. Based on the work of Gurdon, Ian Wilmut on reprogramming, and establishment of Human ES cells by Thomson, he got inspired to create ES cells by reprogramming that could be used for various applications. He felt he could evade the ethical problems associated with using embryos. He wanted to establish ES cell-like pluripotent stem cells that were not derived from embryos, but from differentiated somatic cells. With the initial hypothesis that factors that maintain the pluripotency of mouse ES cells might induce pluripotency in somatic cells. Initially he started with in silico differential display, to identify genes specially expressed in ES cells and shortlisted 24 genes. To work with these 24 genes they developed very sensitive assays to screen and find the genes that can reprogram somatic cells to pluripotent stem cells when introduced into cells. Using these assays they realized that one factor cannot be sufficient for this transformation and came across a set of 4 factors that were critical and could induce pluripotency in mouse somatic cells. These cells were characterized and were found similar to mouse ES. Embryonic cells or iPS are very significant with many applications in medicine and in the pharmaceutical industry. 2017 © scienceindia.in. All rights reserved. Powered by GBS- PLUS.